Youth leader Aamir Shahzad and his family are Ahmadiyya Muslims and don’t celebrateChristmas, but they will be delivering cards and gifts of home-cooked food to their neighbours and friends.And they will not be alone, as their community in Huddersfield is known for its generosity and desire to help others.Acts of kindness towards neighbours are an important part of Islam, says Sabahat Karim, Imam of Huddersfield’s Baitus Samad mosque in Fitzwilliam Street. He added: “We don’t celebrate Christmas as such, but we take part in the happiness of others. We are taught that everything we do is to reform our attitudes and become better people. Islam tells us to help our neighbours and those who are in need. The festive season is a busy time for the members of the Ahmadiyya Muslim Youth Association (AMYA), who work with other community organisations such as the Welcome Centre, Salvation Army and Jubilee Centre to provide comfort and aid to those in need.They visit old people’s homes, take toys into children’s wards in the area’s two hospitals, and donate to food banks.Following the serious flooding in Cumbria, groups from the association, including 10 Huddersfield members, have also been visiting the stricken region offering aid and practical help. Earlier this year one Huddersfield member travelled to Nepal to assist in the aftermath of the earthquake. 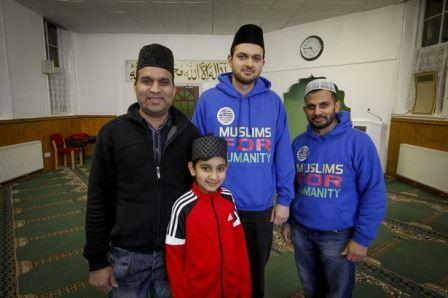 Such actions, says Nadeem Ahmad, regional youth leader for the AMYA and one of the volunteers who went to Cumbria, embody “the true message of Islam”, one that is often submerged when news of terrorist atrocities hits the headlines. Arfan Ahmad, deputy regional youth leader, was heartened to see different groups working together in Cumbria. “It shows unity and brotherhood from the wider community,” he said. But the Ahmadi also accept that terrorism carried out in the name of Islam inevitably damages community cohesion and they need to counter the negative image such events give the religion. In the aftermath of recent attacks, for example, they conducted leafleting campaigns.As Sabahat explains: “People get agitated after these events. We go door to door distributing leaflets, which give the message of Islam. There are a number of people who are not quite welcoming and tell the members to go away and believe that what happens in places like Paris is Islam. But mostly we haven’t experienced a lot of problems with Islamophobia.”The Ahmadi motto is Love For All, Hatred For None, and to this aim the members work for a charity called Humanity First, which responds to global disasters and runs longer term projects around healthcare, education, vocational training, water and orphans.It is just another part of their desire to put their religion into practice.“Everything we practice is to make ourselves better people and enhance our spirituality,” says Sabahat.Which, some might say, is also the true meaning of Christmas. 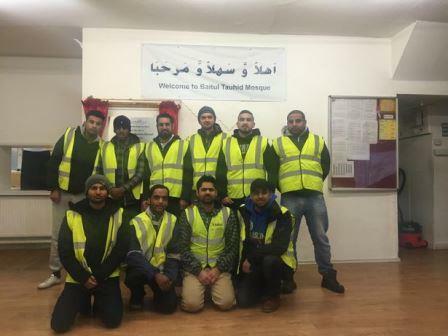 Share the post "Young Muslims in Huddersfield working hard this Christmas to support those is need"